For weeks Alec Bohm was considered to by many as the top offensive threat available in Major League Baseball's amateur draft. A legitimate power threat who can hit the ball to all fields while demonstrating patience at the plate. That combination was what lured the Phillies to select Bohm, a third baseman out of Wichita State, with the third overall pick on Monday night. The 21-year-old improved every year in college, finishing his junior season hitting .339 with 16 homers and a .436 on-base percentage. He can hurt pitchers with the long ball or a shot to the gap, and he isn't afraid to take pitches to work a walk. 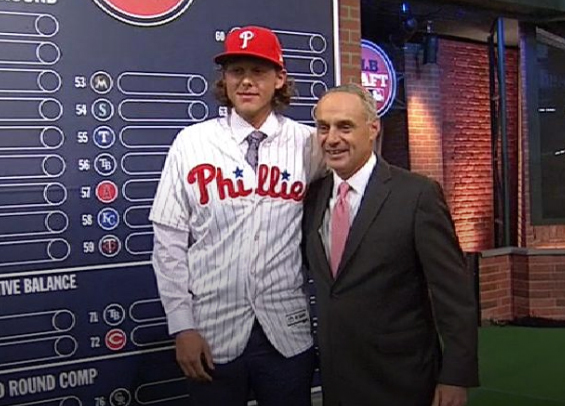 "There was a lot of discussion in the room with a lot of good college talent this year," Phillies scouting director Johnny Almaraz said Monday night from Citizens Bank Park (see video). "We were very, very lucky to get the guy that we were focusing on throughout a good part of the season. Alec Bohm is a middle-of-the-order bat." The 6-foot-5, 220-pound Omaha, Nebraska native was named a second-team All-American this year by Baseball America. He moves well for his size and is adept at third base, though he eventually may play first base or a corner outfield position. His work ethic is outstanding, according to scouts and those that have seen him progress through his time in college. A right-handed bat, he has a quick swing that stays through the strike zone. "He's a very athletic player. He's a good third baseman. With some instruction, I believe that he's got the chance to be an average to an above-average third baseman at the major-league level. He's very athletic for his size at 6-5," Almaraz said. Bohm's patience at the plate and ability to manage the strike zone may put him on the fast track to Philadelphia. It's been a point of emphasis for manager Gabe Kapler since he joined the Phillies this past offseason. "He can really hit and he commands the strike zone unbelievably well," Almaraz said. "He's got a lot of leverage in that swing. He can drive the ball out to all parts of the field. He's got what I call wide-field power meaning that he can hit home runs from gap to gap." The next step for the Phillies is to ink Bohm to a contract. The No. 3 spot carries a bonus of $6.9 million. Almaraz said a deal should be in place shortly. Bohm said he didn't know it, but according to Almaraz the Phillies had more than a dozen scouts and talent evaluators watch him over the past year. As for the future, he sees Philadelphia as a great landing spot. "I've actually kind of taken a liking to them in the past couple of months," Bohm said in a conference call with reporters on Monday. "They have a young club and they're doing better than they were expected to. I like them so far. They've kind of become one of my favorites."